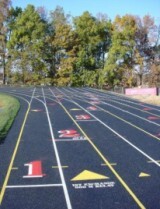 When you choose a new running track for your school, you want the best track surface that your money can buy. You want a track that is safe, has excellent performance characteristics, and is attractive and easy to maintain. We know you want a track that is a source of pride and an asset to your school. You want a running track provided by Current Surfaces, Inc.
Current Surfaces, Inc. has been building and maintaining high school and college synthetic running track surfaces in Michigan, Ohio, and Pennsylvania since 1983. We’ve also been building tracks in Kentucky and West Virginia since 2005. We also serve the Northwest quarter of Indiana and we have built tracks there since 2007. We provide a selection of synthetic running tracks using our patented Seal-Flex and Gen-Track systems as well as track maintenance and restoration services. We also just developed a new surface in 2012 that utilizes Nike Grind, which is recycled tennis shoe rubber. This new surface allows us to offer a dual-durometer system that can help the performance of distance runners without sacrificing durability. THE 2013 CURRENT SURFACES, INC. TRACK ATHLETE SCHOLARSHIP HAS BEEN AWARDED TO ALLISON FOSTER OF UNION CITY HIGH SCHOOL IN MICHIGAN! CONGRATULATIONS ALLISON! Go to “Scholarship Opportunities” to learn more about the Current Surfaces Track Athlete Scholarship.